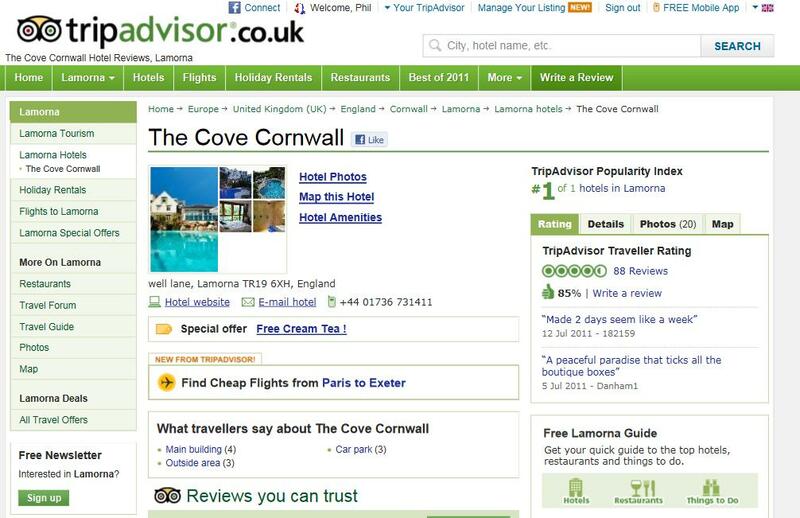 Once again TripAdvisor is in the headlines for fake reviews – this time a hotel in Cornwall, England is accused of bribing customers to post positive reviews. The Cove Hotel Cornwall flatly denies any bribery* (see end of article) saying it had no motivation to “pimp” its reviews as it was already highly placed and that the incentive was to reward loyal customers. One thing is certain – there’s nothing new or remarkable about fake and fixed reviews on TripAdvisor. This blog has exposed dirty dealings around TripAdvisor reviews several occasions and I was going to let this one pass – until I noticed a curious statement in several articles concerning TripAdvisor and “blacklists”. Several articles (see foot of page for links to articles) claim that “TripAdvisor has already blacklisted 30 properties worldwide for suspicious reviews”. Secondly, I checked back to an article on this blog in November 2010 and at that time 280 hotels etc. were “red flagged” by TripAdvisor. So had TripAdvisor has removed 250 “red flags” since 2010, leaving only 30? A Google search of the TripAdvisor site seems to show there are now as many as 13,500 properties “red flagged” – however, clicking through the pages it actually stops at 270 (what’s going on, Google?). On top of these properties, it is highly probable that many more underhand owners and managers get away with faking reviews and are never caught – it is hard to believe that TA catches the majority, as anyone with a basic grasp of internet protocol can overcome their checking procedures. Due to its dominance, there is a growing incentive for the unscrupulous to rig TA reviews and ratings for their own and competitor businesses, or for the malicious to do damage through fake or unwarranted reviews. Meanwhile TA continues to buy out anyone it sees as potential threat – the latest is “Where I’ve Been“. A virtual monopoly like this is not healthy – the travel review market needs competition if it is to have any credibility. This is a perfect example of the media trying to create a story from nothing. It should be clearly stated that our hotel has received countless rave reviews from recognised publications such as The Times who recently voted us No 5 in their top 20 British Rooms, The Guardian in their Top 10 Hotels of the Decade, The Telegraph and countless other national publications. It should also be duly noted that The Cove Cornwall received a Certificate of Excellence from TripAdvisor on May 27th, nearly one month prior to the set up of their Friends of The Cove Scheme. Why then should be have been in need of “bribing” customers to post positive reviews on their site? It simply makes no sense! The press are forever themselves creating “incentives” for their readers to endorse their name and products to increase their customer reach. All we were trying to achieve, was to thank our loyal return customers, Brand Champions, in a tangible manner. Also, the quoted statement made by the owner Lee Magner, used by both The Sunday Mirror & The Daily Mail, is inaccurate. We would very much like to see this problem resolved and are more than happy to respond to any and all queries. This entry was posted in tripadvisor and tagged bribery, red flag, review, the cove, tripadvisor. Bookmark the permalink. Interesting blog! If you guys need more information on google penalised please refer to google penalised website (it also has Cove Hotel Bribery and TripAdvisor Blacklists … section) or contact me at daveblythe@gmx.com and take advantage of special discount which is valid on every Wednesday. Hope this helps.